Keystar House. During the recording sessions for ‘Expanding the Canvas’ album for Rod Pooley, James Asher discovered that they shared an enthusiasm for the style of music typified by the likes of David Guetta and Swedish House Mafia, a genre in which neither had worked previously. They were attracted by the positivity and energising quality of this medium. Rod brought to the party the same dazzling keyboard skills that have gained him the role of being one of Korg’s main demonstrators in the UK. A role that necessitates being familiar and comfortable with a wide span of musical genres, including jazz in which Rod is fluent and adept. Joining him James Asher’s experience as drummer, writer and producer offered a strong complement. Previously best known for his worldbeat albums and crystal clear production style, James has a passion for collecting a huge palate of sounds in his Starfield Studio, which are for him the source of great inspiration. 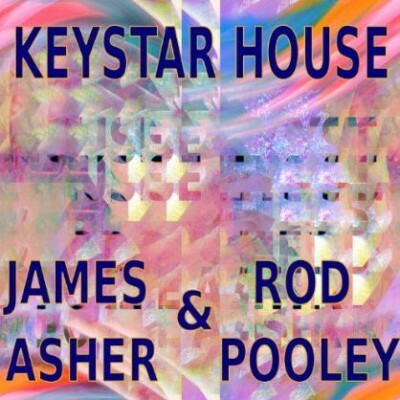 The blending of these two talents exploring and co-writing in this contemporary dance genre resulted in the Keystar House album. The breadth of their joint previous musical experience shows in the rich variety of musical ideas to be savoured in the album. Strong melodies are set within fresh and imaginative arrangements alongside kicking beats to provide a compulsive and satisfying treat for the ears, soul and feet. Follow Keystar House on Facebook.